C-I Stainless Steel Posts | Parkell, Inc.
C-I Stainless Steel Flat Head Post from Parkell is designed for use on composite and amalgam cores. The high quality post is equipped with serrations to allow for strong retention in the cement as well as undercuts to grip the core material. The Flat head Post is available in Fine and Medium both in packages of 10. 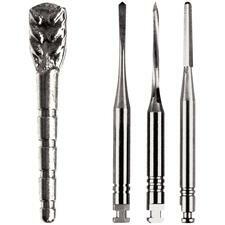 The Starter Kit contains: 20 flat head stainless steel posts, 20 plastic core patterns and 3 drills (ABC).